A multistorey tower temple with pent or composite pent-n-gable roof. Among the ‘tower temples’, the loftiest example in the entire Himalayan region may be the Great Tower of Chaini above Banjar on way to Jalori Pass. This tower, popularly known as the Dhadhiya Kot after the name of the thakur who built it, was originally a seven-storey tall structure. However, it lost its two upper stories to the CE 1905 Kangra Earthquake, and now only five storeys, rising to 45 metres height,remain. In the medieval past, it garrisoned troops on its lower floors, while the top-most floor was where the Joginis were enshrined. 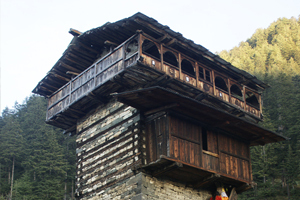 Today, this tower stand stoically overlooking the Tirthan Valley, is the solitary home of the Joginis, rest of the floors have been long deserted. Also, there is a recently built dwarf-tower-like structure that serves as a bhandar of Shringi Rishi at village Sarahan, higher up in the Kurpan Valley below the Bashlau Pass in the Outer Saraj area.